The weather we had this week was just about unbearable. We had below zero weather what seemed like an eternity and when it did warm up a bit we had freezing rain and snow… when is spring coming? 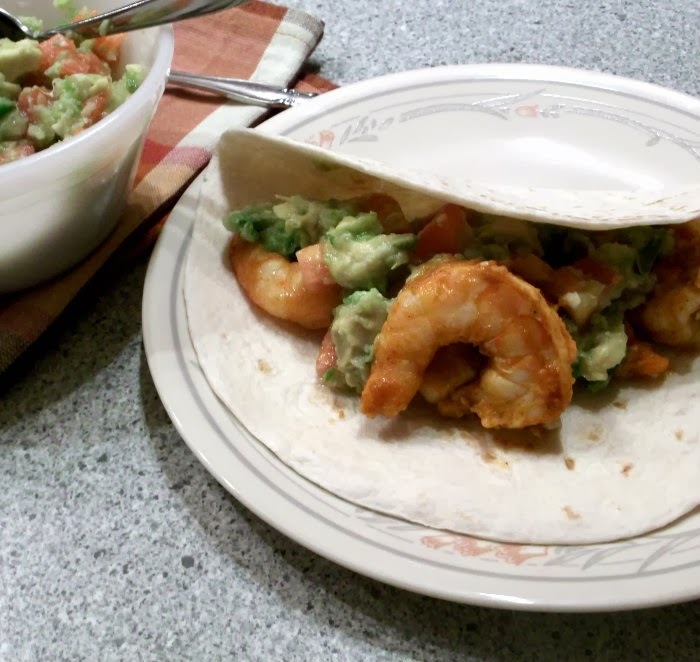 I needed something to warm up the inners, so I made this shrimp taco recipe with a spicy avocado salsa. The salsa most definitely warms things up a bit. Jalapeno, garlic, and onion spice up this salsa and the avocado adds a nice creamy blend to it all; add some tomato, salt, and lime and you have a very spicy but tasty mix. shell you will forget about the cold weather… the heat of these tacos will definitely warm your inners. 1. Put the onion, Jalapeno pepper, and garlic in a food processor and process until finely chopped. (A mini food processor works great for this). 2. Transfer to a medium bowl; add the chopped tomato, avocado, salt, and lime juice and stir to combine Set aside. If you are not using it right away place plastic wrap over top of bowl and set in refrigerator until you are ready to use it. 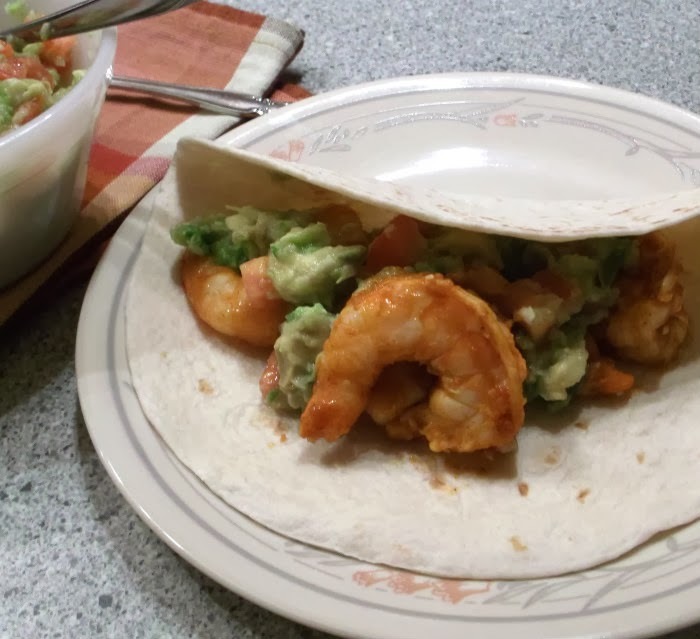 1 In a medium bowl combine taco seasoning mix, garlic, and lime juice mix well; add the shrimp and toss to coat. 2. Heat oil in a large skillet over medium-high heat until hot. Add the shrimp mixture; cook and stir until shrimp is pink about 6 to 8 minutes depending on the size of your shrimp. 4. 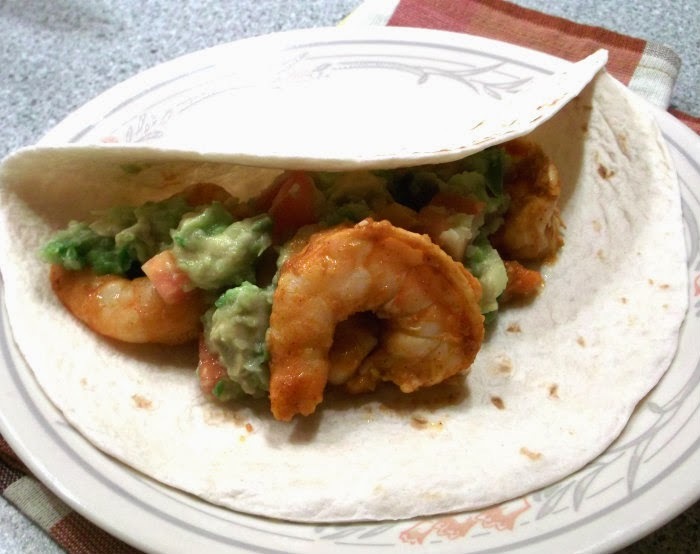 Add shrimp and avocado salsa onto a soft tortillas shell along with whatever other topping you may want add. Terrific dish! You’ve really packed an awful lot of flavor into these tacos. This looks like the sort of dish I’d make! Thanks so much for this. I need some of these spicy delicious tacos ASAP! They look amazing Dawn! By eating these tropical flavors, you can at least pretend to be somewhere warm! Mmmm.